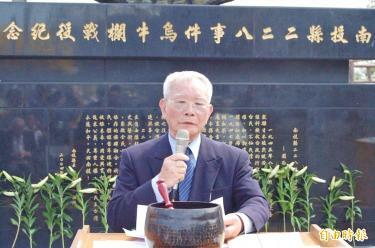 World War II veteran and resistance fighter Huang Chin-tao speaks in front of a monument commemorating the Battle of Wuniulan in Nantou County’s Puli Township in an undated photograph. 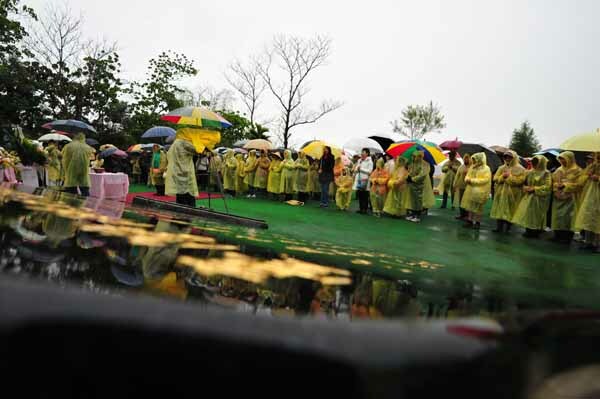 Dignitaries, family and friends are today to pay tribute to Huang Chin-tao (黃金島), a World War II veteran and resistance fighter who battled Chinese Nationalist Party (KMT) troops during the Taiwanese uprising of 1947 and was imprisoned for 24 years, at a funeral in Taichung. Vice President Chen Chien-jen (陳建仁) is scheduled to attend on behalf of President Tsai Ing-wen (蔡英文) and bestow the presidential citation on Huang and his family, while politicians including former president Ma Ying-jeou (馬英九) are also expected. Obituaries said that Huang, born as Huang Tsun-tao (黃圳島), dedicated his whole life to transforming Taiwan into a democracy and strove for formal independence until his death on Jan. 8 at the age of 93. After World War II, Huang was detained in a prisoner of war camp on China’s Hainan Island, where he had been stationed as a soldier in the Japanese Imperial Army. After he escaped in 1946, he and fellow Taiwanese soldiers paid their own fares to return to Taiwan by ship. In Taiwan, Huang saw undisciplined KMT troops confiscate goods, ransack houses and mistreat Taiwanese, leading to social unrest that culminated in the 228 Incident of 1947. Huang said that after he saw KMT soldiers shoot indiscriminately and massacre people in the street, he joined the Taiwanese provisional army as the commander of the well-known 27th Brigade to fight against KMT troops and protect the residents of central Taiwan from the killing and plundering. On March 16, 1947, he lured the KMT army’s 27th Division troops into Puli Township (埔里) in Nantou County, where his brigade engaged government troops in a final stand at the Battle of Wuniulan (烏牛欄之役), at the site of the present-day Ailan Bridge (愛蘭橋). The odds were stacked heavily against Huang’s brigade, which was bombarded by the enemy throughout the day, and by nightfall, its ammunition was running out. On the night of March 16, Huang disbanded what was left of the unit and the guerrillas retreated into the forest. Huang was arrested and given a life sentence, which he served in military prisons before finally being sent to the notorious prison on Taitung County’s Green Island (綠島). Huang was released in 1975, by which time he was 50 years old and was labelled a political prisoner. That prevented him from being hired, so that he could only perform manual labor for low pay. He remained under constant surveillance by KMT police and intelligence agents, and was regularly harassed by the authorities. On Dec. 10, 1979, Huang and his wife took part in the protest for democracy that led to the Kaohsiung Incident. Huang was among the founders of the Democratic Progressive Party (DPP) in 1986 and served as an executive at the DPP’s Taichung chapter. 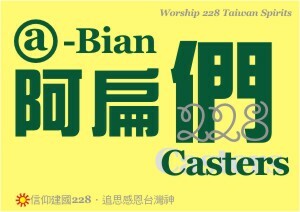 Through the years, as Taiwan gradually became more open and evolved into a democracy, Huang served three terms as a board member at the 228 Memorial Foundation, assisting with investigations into the 228 Incident, and seeking compensation and justice for victims and their families. In later years, Huang led an ultimately successful drive to erect a monument at Ailan Bridge to commemorate the Battle of Wuniulan, as well as one in Taichung to honor the members of the 27th Brigade. He taught history to young people, taking them on tours of the 27th Brigade’s movements, led tours at Ailan Bridge, where he recounted the battle and described the military positions. In 2000, Huang received the Human Rights Award from then-president Chen Shui-bian (陳水扁).